At last something new devoted to watchmaking in the realm of iPad and Android apps! With Zenith Watches – The Experience, the Swiss watchmaking manufacture ventures into hitherto unexplored territory. A glimpse of what can happen when the fun side of things is placed at the service of the client experience. To be downloaded as fast as possible. You dream of being the centre of attention by explaining a tourbillon or a fusée-chain mechanism in a few simple words? You’d love to understand why a mechanical watch has to be undergo period maintenance? And you don’t dare ask what it will cost? You prefer intuitive touch technology instruction manuals to thick, illegible printed documents? You have never understood how to adjust the Worldtimer function of your timepiece? You have no idea that you are strongly advised NOT to operate the pushpieces of your chronograph when the latter is underwater? If you have answered any one of these questions in the affirmative, the Manufacture Zenith has exactly the app for you! 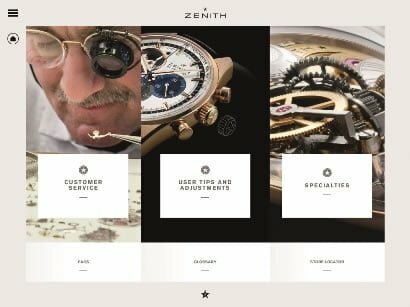 Warning: Downloading the Zenith Watches – The Experience application might expose you to a completely new way of looking at your watch and what happens backstage in a watchmaking Manufacture. 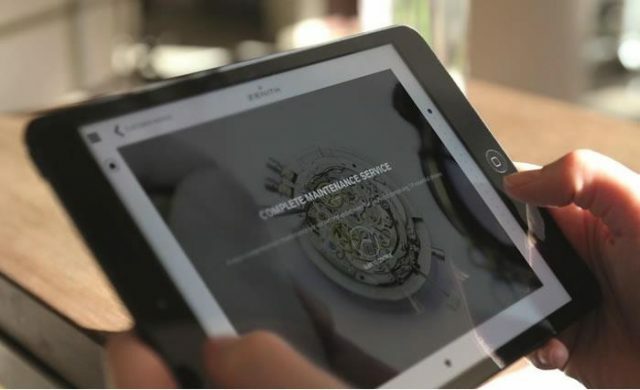 This intuitive and informative new app – available in seven languages – is designed to be a companion to Zenith clients and to provide them with the best possible once the watch is on their wrist. An app that extends the life expectancy of your watch! 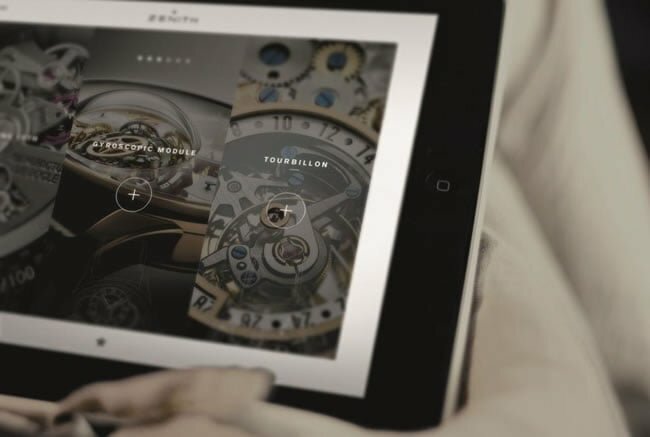 Zenith Watches – The Experience is first and foremost an iPad and Android application unlike any other. After this, it is the only application whose downloading will definitely have a beneficial effect on the lifespan of your watch. And finally, it is a tool that is indispensable to having a good understanding of the mechanical object that you have acquired and you intend to look after. Using videos, tutorials, texts and photos, the experience offered by the Manufacture Zenith is guided by clear navigation that leads you through distinct and understandable menus. Customer Service, User tips and Adjustments as well as Specialities make up the main sections while Frequently Asked Questions, Glossary and Store Locator round off the palette on offer. The Customer Service section provides the hoops through which every Zenith watch has to jump when it is back at the Manufacture for a maintenance service. Three types of service – and three quotations – are offered to the client. The eight main phases of the partial maintenance service (recommended every three years) are described in the menu as are the 14 stages of which the complete overhaul consists (recommended every five years). With its particularities, the restoration service reserved for historical watches is also presented in detail. The User Tips and Adjustments section offers adjustment tutorials brought to life and supported by a voice-over for each complication and each Zenith mechanical movement. Enough to put most printed user manuals away in the cupboard without the slightest hint of regret. But that isn’t all – this section also incorporates a multitude of practical recommendations that make it possible to avoid inflicting inappropriate treatment on every mechanical watch. For example – did you know that it is advisable to keep all mechanical watches away from every kind of magnetic field – including computer screens? The Specialties section is reserved for all those who have always wanted to know more about watchmaking complications without ever having dared ask. Here, the Manufacture Zenith details some of its specialties in the menu and explains the principle and the functioning through the use of drawings, audio documents and videos. From the Tourbillon to the famous Gyroscopic Module (patented by Zenith) via the Equation of Time, a total of six specialties are presented and explained in this section. For many people, this is sure to provide endless discoveries and revelations. On the practical side, the usual Frequently Asked Questions section takes on a completely different, captivating allure. How many of them would you be able to answer? And yet, your watch would be so grateful to you! The Glossary, on the other hand, guides neophytes through the maze of watchmaking appellations and terminology. But note the difference: this is not an entire, thoroughly indigestible dictionary, but a compendium of watchmaking terms used in the app. Finally, if you are looking for or have found your next Zenith – or if you are intending to have yours services, the Store Locator will be a valuable help. Entertaining, informative and practical, the new Zenith Watches – The Experience is available free of charge from today in the Apple Store and on Google Play.